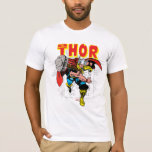 Red Lettering Modern marvel T-shirt. Dynamically designed by you, this customizable, heavyweight white t-shirt with red lettering. Custom letters stand out with bold red type and modern twist. Made from 6.0 oz, pre-shrunk 100% cotton, it wears well on anyone. We’ve double-needle stitched the bottom and sleeve hems for extra durability. 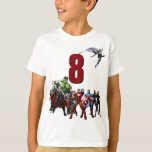 It's time to suit up and be the superhero who really saves the day with this cool design from Marvel! 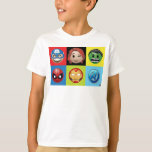 Featuring classic comic characters that we all know and love such as; Thor, Captain America and Iron Man. 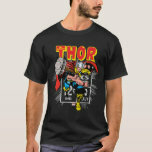 Vintage cartoon heroes that come alive with this Avengers shirt you can customize with your name or a personal message. Heroes inspiring kids on their birthday across the globe. 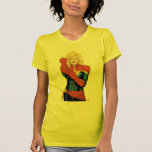 Check out this cool comic art of Captain Marvel as she stretches on her red glove to fit her fist! professor marvel never guesses. he knows! Check out this disintegrating Marvel Logo, breaking apart into squares. 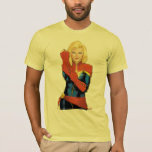 Celebrate your child's birthday with this Captain Marvel custom age t-shirt! Enter your child's age and name in the template fields provided. Check out Captain Marvel looking up into the sky as four jets fly up in formation behind her in the starry night sky. Check out this vintage comic book art of Thor throwing his hammer, overlaid atop the retro comic book price info panel as seen on his original comic book series! 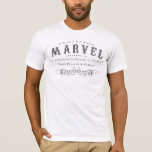 Show off your love of all that is Marvel with this Marvel Logo tshirt! 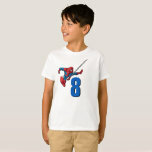 This cool printed t-shirt follows Spiderman as he embarks on another action packed adventure. Spidey looks ready to websling into another crime fighting escapade and you can too with this fun, colorful design! 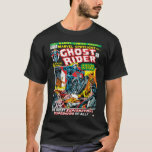 Inspired by the Marvel Universe, this awesome shirt will appeal to kids, adults, and lovers of the classic comic books alike! 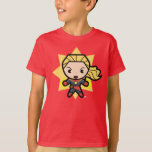 This cute cartoon of Captain Marvel shows her powering her fists with photon energy! 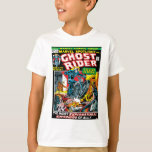 Check out this classic Marvel Spotlight comic issue #5 book cover featuring Ghost Rider in his origin story, displaying various scenes from within the book. Check out this faux metallic Marvel Logo. Marvel Emoji | Check out this colorful checker grid pattern featuring various Avenger and Guardians of the Galaxy icons.